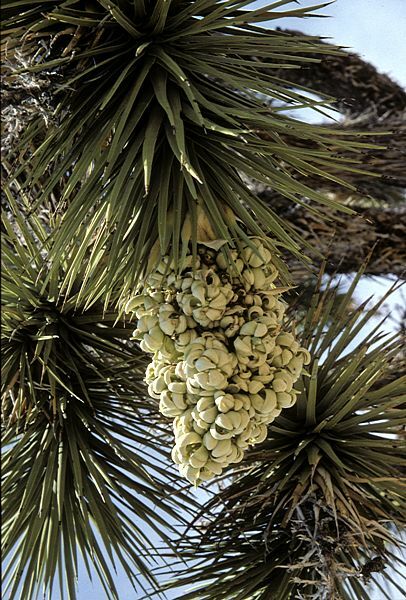 The succulent tree Yucca brevifolia is an indicator plant for the Mojave desert with a National Park named after it. 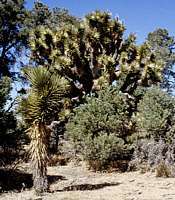 Large specimens grow up to 10m tall and branches bend down or stick out at odd angles. 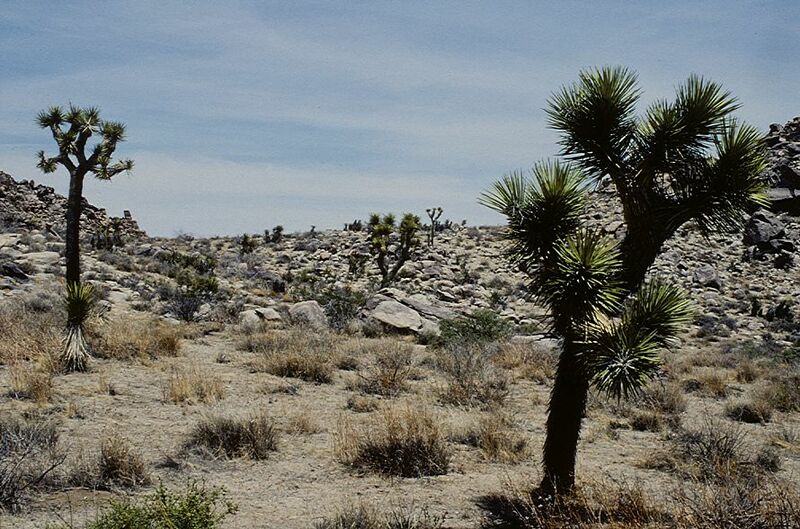 This is said to have reminded early Mormon settlers of the prophet Joshua, with his arms outstretched in prayer. 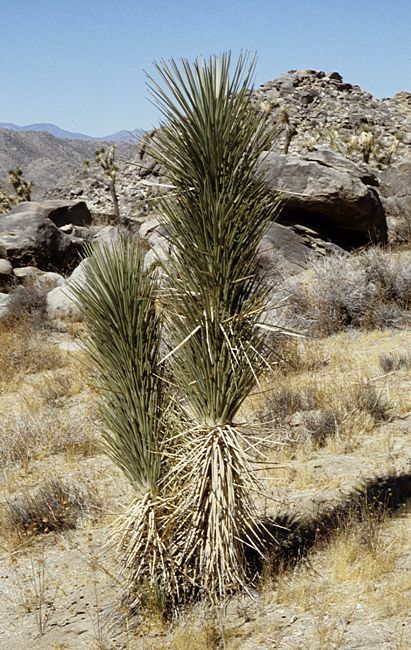 Several varieties of Yucca brevifolia have been described, although considerable variation in growth is seen between individuals in most populations. 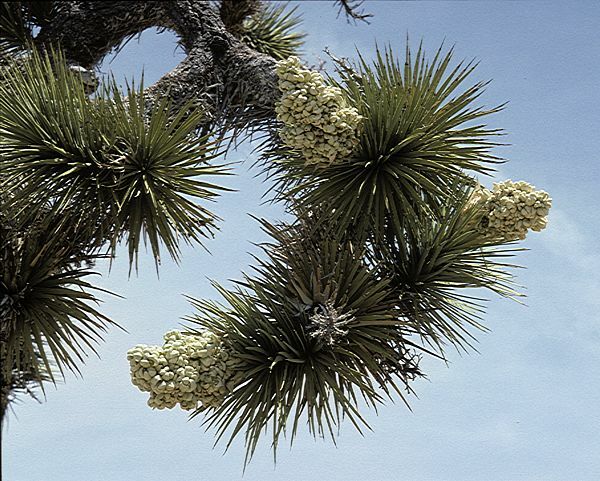 Yucca brevifolia is tolerant of cold but not of damp, so only really suitable for succulent plant landscaping in a really dry climate. 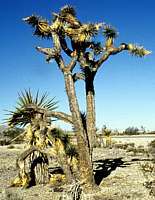 However, Joshua Trees are great survivors in otherwise inhospitable locations across parts of Nevada, Arizona and California. 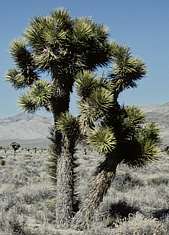 This page gathers together images of Joshua Trees from a variety of locations hundreds of miles apart, travelling approximately North to South. 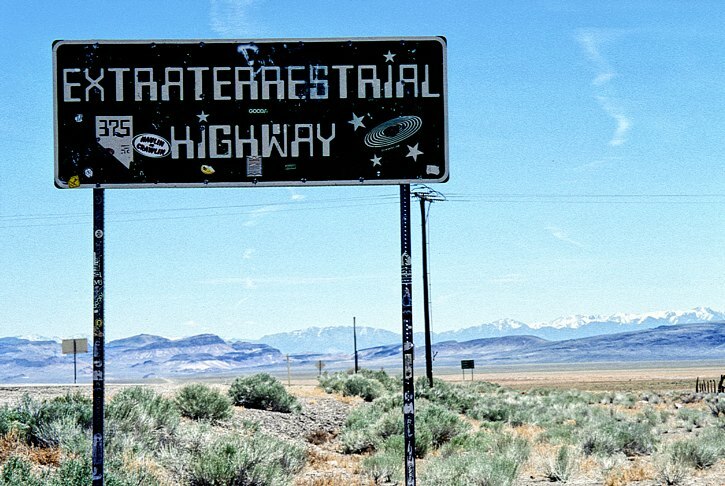 Near US375 (The Extraterrestrial Highway), just South of Rachel, Nevada. 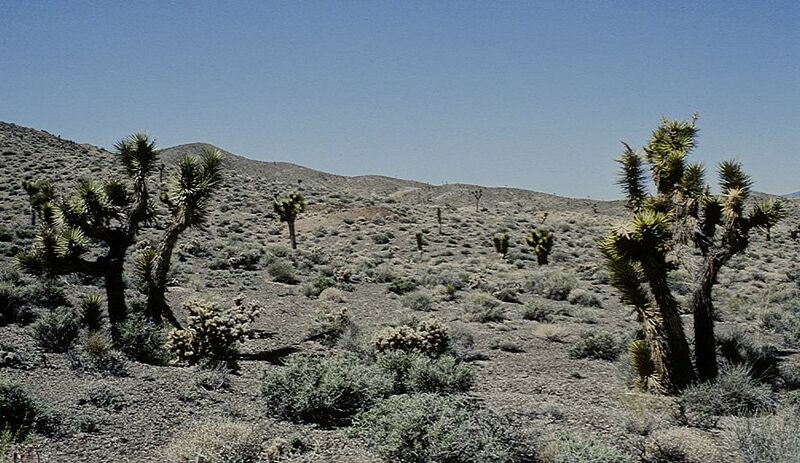 This area is well-known to UFO hunters, possibly related to its proximity to the notorious Area 51. 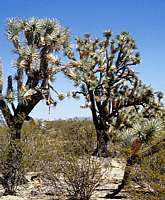 A large forest of Joshua Trees grows on both sides of the road, with a lush undergrowth of grasses, small scrubby plants and a few cacti. 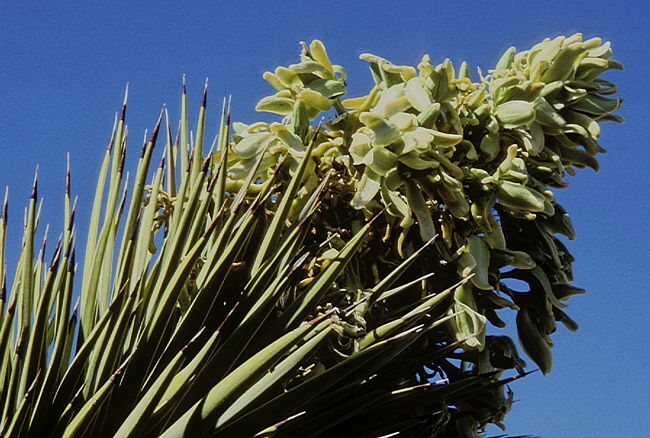 The exotic foliage of this succulent tree features in the landscape of 'distant planets' in a few episodes of 'Star Trek' and some other science fiction movies. 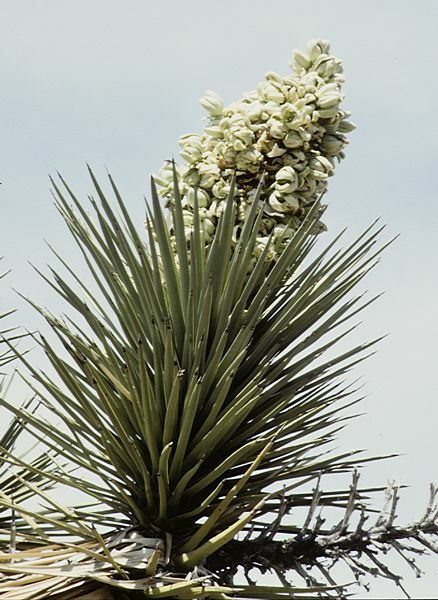 Left: The inflorescence is a short panicle of greenish-white bells held close to the foliage. The flower petals often don't open properly. Flowers are said to have a slightly unpleasant perfume, although it's not easy to get near enough to find out. 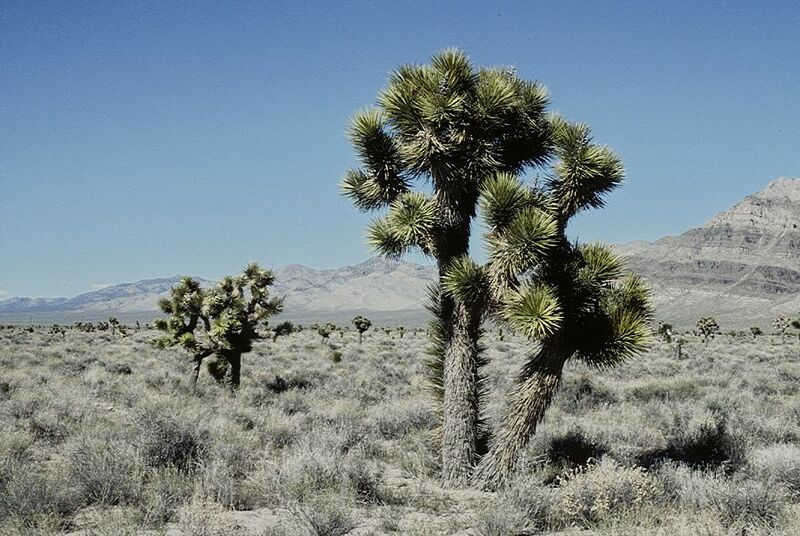 Left: at Gold Point ghost town, Lida Valley, Nevada. Silver ore was mined here and there are many excavations, spoil heaps and other industrial archaeology. 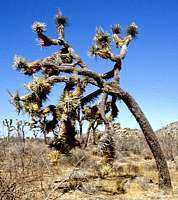 The succulent vegetation appears to be on the edge of survival. 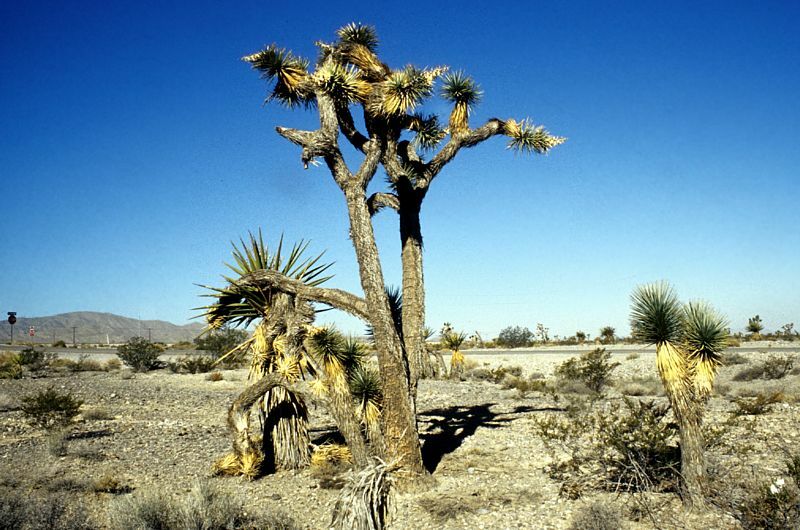 Water is scarce and the gravelly soil probably loaded with heavy metals from numerous spoil heaps. 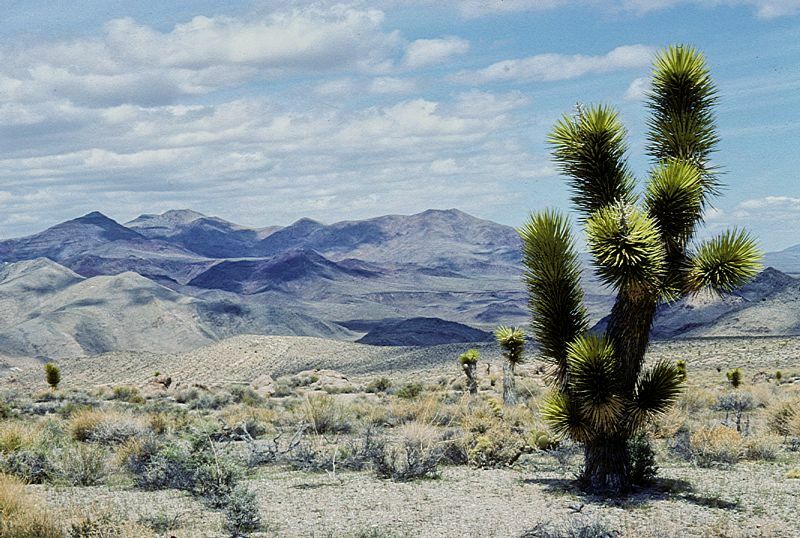 Right: West of Panamint Valley, California. 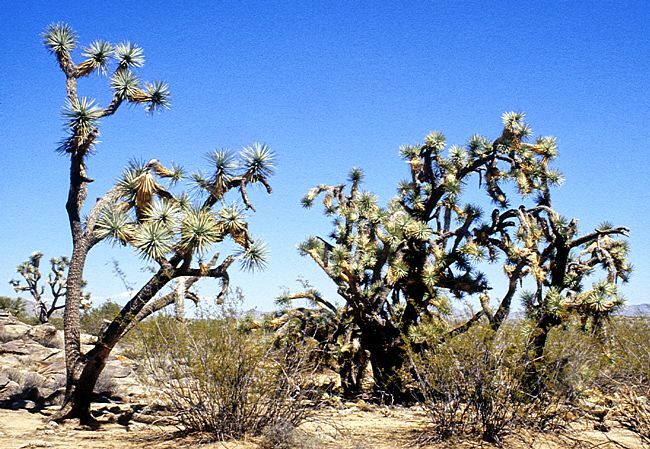 Despite the aridity and sparse ground cover, the Joshua trees are green and healthy. 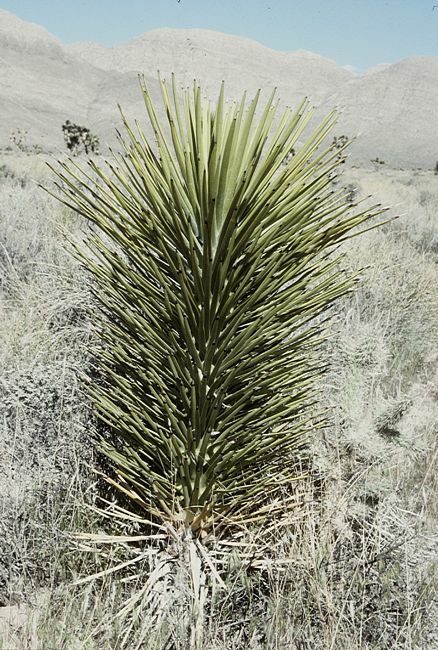 Roadside habitat 20 miles North from Las Vegas occupying a wide strip of gravelly land between the freeway (US95) and government land beyond a fence to the East. 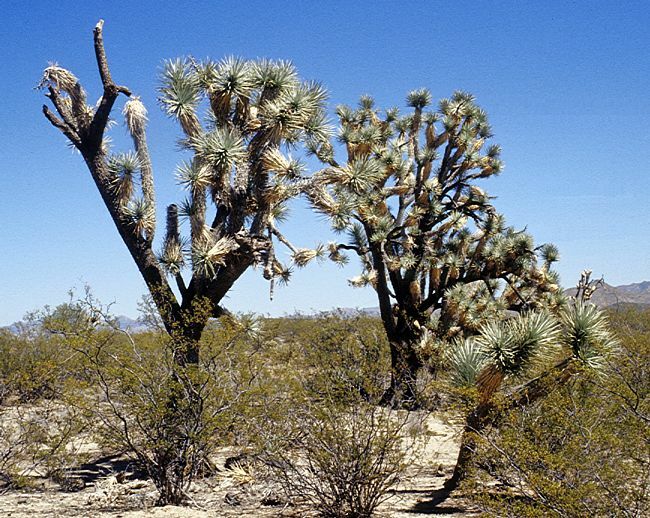 Joshua trees were growing together with Yucca schidigera, cacti and creosote bushes. 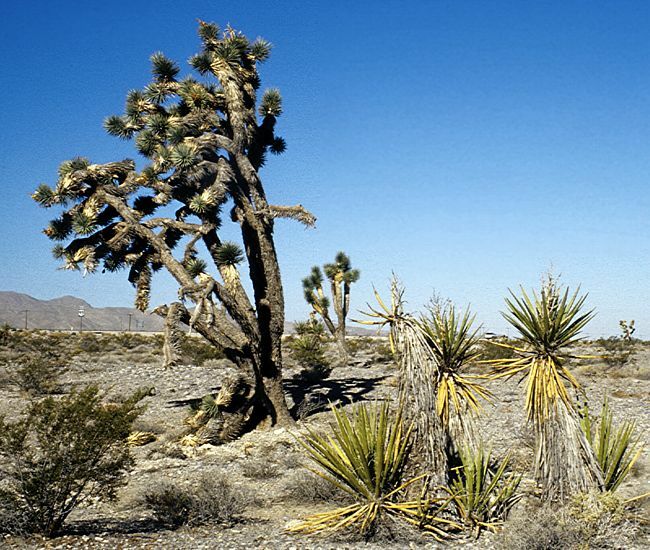 Left: a substantial forest of Joshua Trees grows either side of the Joshua Tree Forest Parkway (US93) between Wickenburg and Kingman, Arizona. 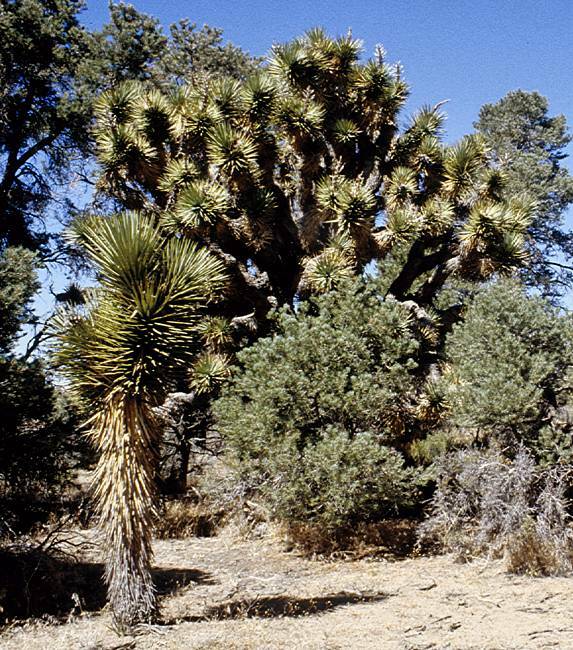 There is a lush undergrowth including grasses, creosote bushes, Yucca schidigera and cacti. a short walk from US187. 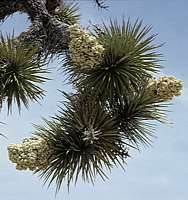 Above: Yucca brevifolia in flower near the West entrance, Joshua Tree Park, California, May Day 2006. 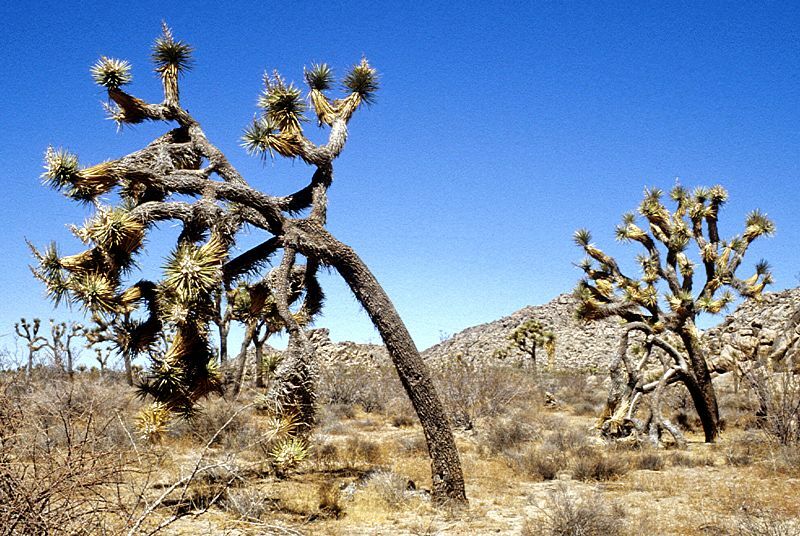 Joshua Trees in the park are often characteristically bent and twisted. 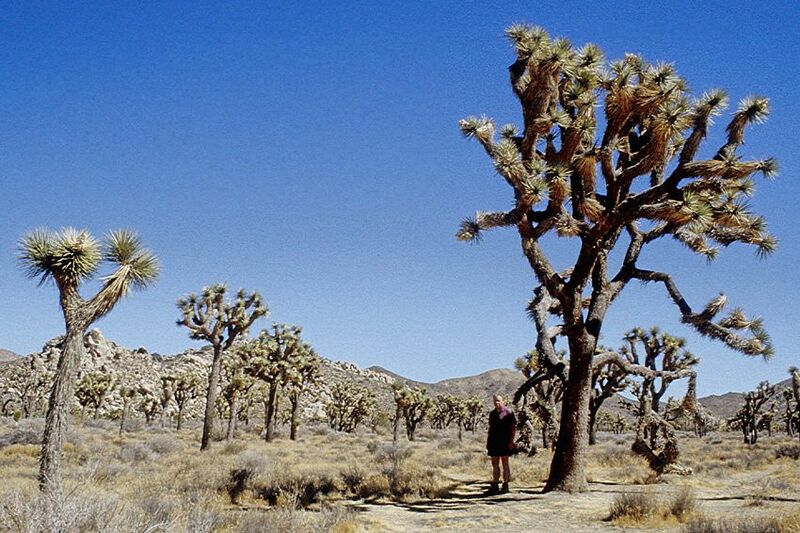 Right: in the middle of the day, the author stands in the welcome shade of a Joshua Tree, estimated as over 27 ft tall. 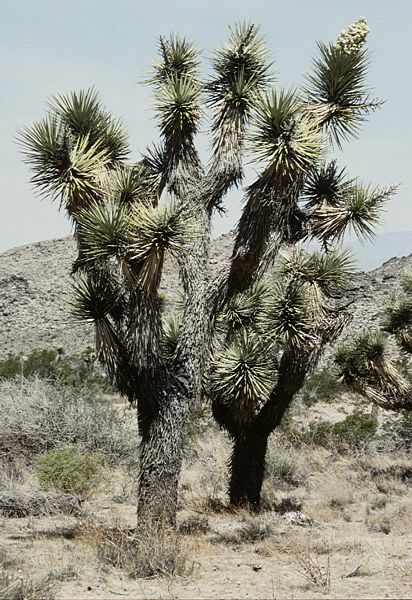 This magnificent specimen is part of the Joshua Tree forest either side of the road to Key's View. 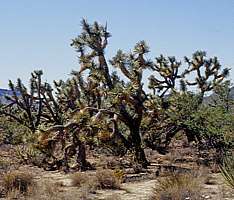 The hills behind this forest are host to many interesting succulent plants including Dudleya and well worth exploring.